Cupid surely shot lots of hearts with his pointed arrow on this brightly red and festive hand painted Valentine's Day wine glass. The hearts are all varied in sizes and entwined with ribbons of red and gold. Some hearts are hand painted brightly red while others are left open symbolizing to let love in. 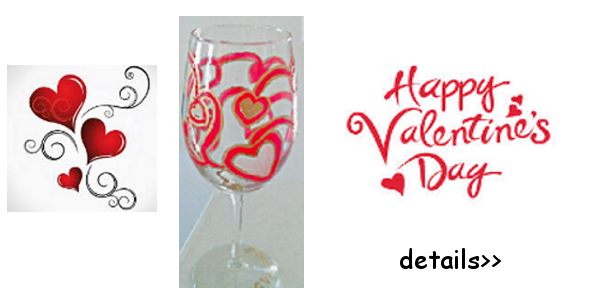 Celebrate this day of Love with your Valentine by drinking your favorite necter from these hand painted Valentine's Day wine glasses.